These Candle Holders typify what Hardy calls the elegance and strength of the West. Each Holder is 6inches at the base which features not only 2 hand sculpted cowboys on bucking horses but also filigreed flowers and scrolls. The base meets the center ring holding the TCAA Logos enveloped by filigreed scrolls, on their center ring rest the candle seat 5 inches in diameter which is also surrounded by filigreed scrolls. 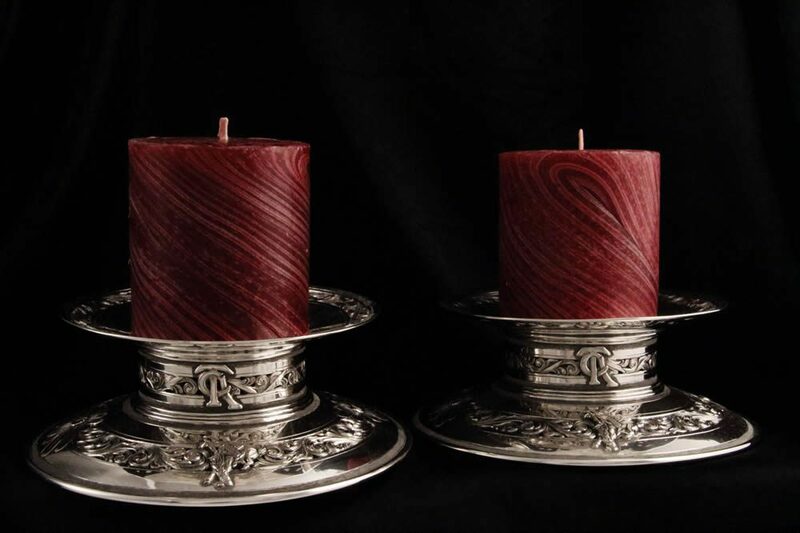 Each of these exquisite Sterling Silver Hand Created Candle Holders weigh approx. 1.5 pounds! 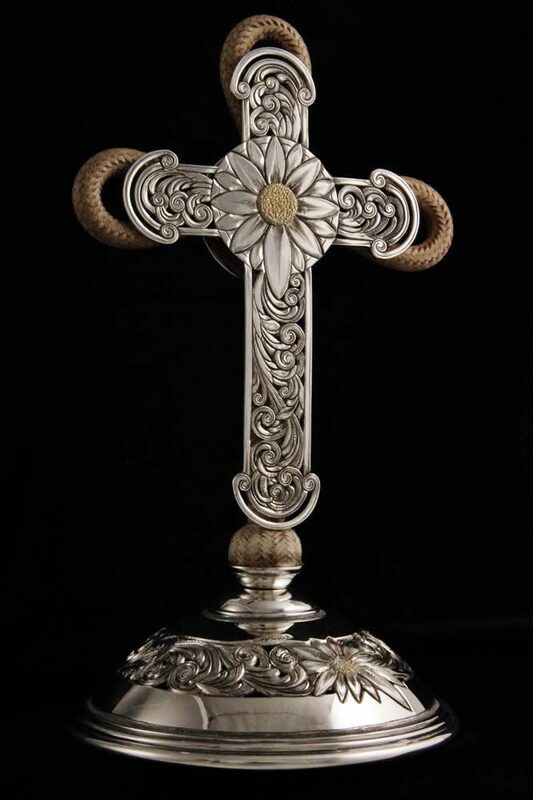 Scott created this cross out of materials found in use on most ranches, heavy Sterling Silver and Rawhide speaks directly to the Faith and Strength of the West. The base and cross are brought to life with intricate flowers featuring 14K Gold centers and filigreed scrolls. Backed by natural Rawhide cross that transforms from round 20 plait arms into a 28 plait round braided body by Pablo Lozano. In total the cross stands 8 inches high and 4 inches at the base. This 3 piece Buckle Set (buckle measures 3"X2.5"), (keeper 1"), (tip 2") is created to fit a one inch belt and is both serious and fun! 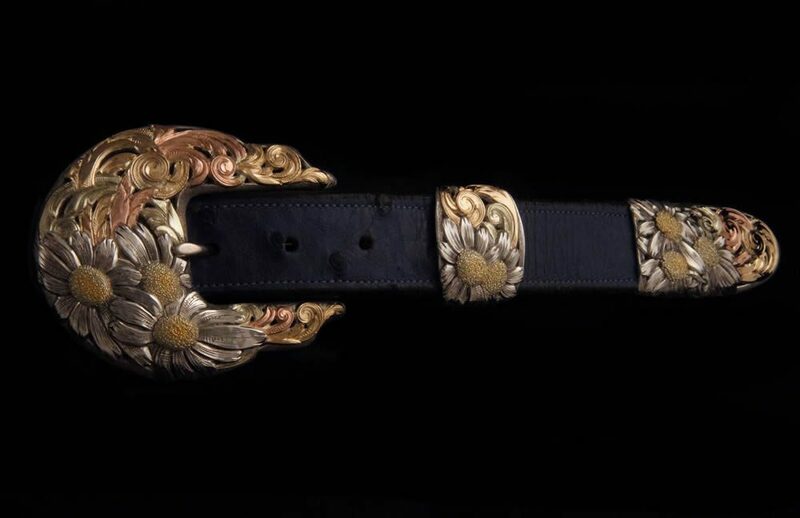 There is an unbridled feeling of motion as the 3 color (red, green, yellow) 14K Gold scrolls emerge from beneath the bed of Sterling Silver flowers all finished with 14K green Gold centers, seemingly in a rush to encompass the buckle itself. The back features a 14K flower and the TCAA Logo. 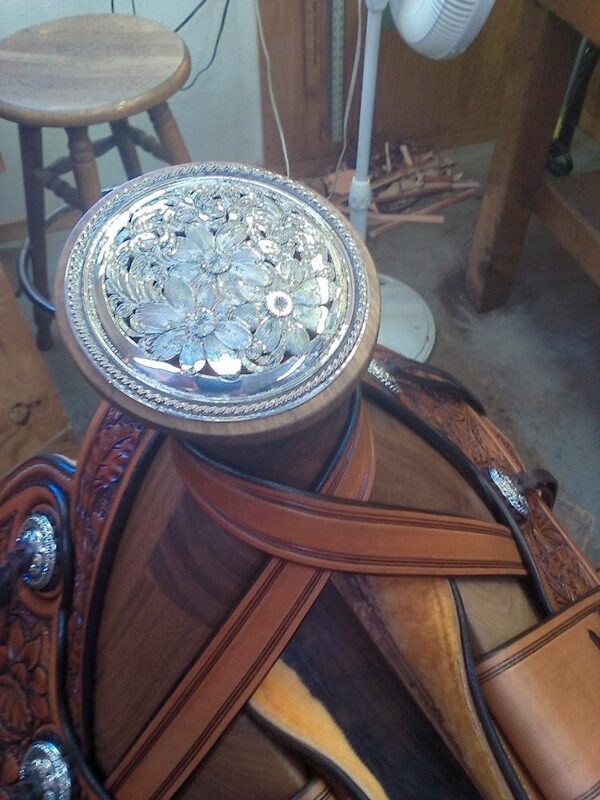 Pedro Pedrini paid tribute to the ranching heritage of his adopted state by building an 1875-era California-style, half-seat saddle complete with 7/8 rigging and a Spanish- influenced horn and cantle. 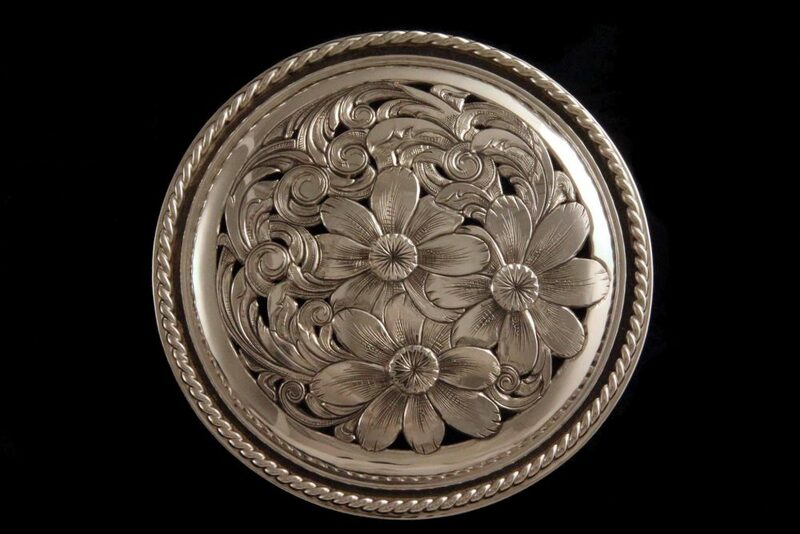 The skirting is fully carved in mixed flowers darkened by a medium-brown antique finish. Scott Hardy designed and fabricated the sterling saddle silver including the engraved silver overlay on the brass cinch rings. 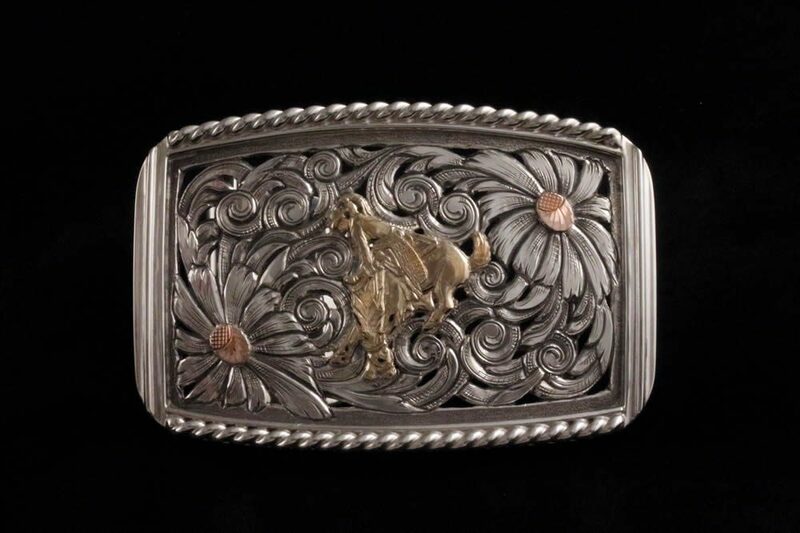 Bronc Stomper is a rectangle Buckle 3.25 inch X 2.25 inch with a unique edge framing a hand sculpted 14K yellow Gold cowboy topping off his horse which is surrounded by filigreed flowers with 14K Red Gold centers. Fully filigreed and hand engraved.